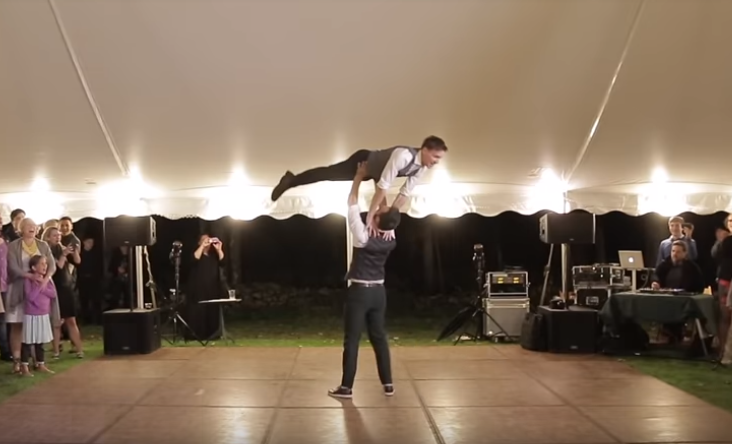 Noah and PJ are married now, but they shocked their wedding guests when it was time to take the floor for the traditional “first dance” as a couple. What they didn’t tell celebrants was that they had a surprise in store – complete with a smorgasbord of gay anthems and an ending that brought down the house. The two start out with a traditional slow dance to Morgana King’s “It’s A Quiet Thing,” and then… magic happens. “We seriously did have ‘the time of our lives’,” the couple wrote when they uploaded the video to YouTube. The couple credit Nieves Latin Dance Studio for the choreography and the movie Ex Machina for the disco inspiration.